Yes, you read that right Seagate’s introduce the monster of SSDs, it builds world’s first 60TB Solid-State-Drive which will blow your mind. You already knew that previous Storage king is the Samsung’s 15TB SSD which became available to purchase, but the Seagate’s new 60TB SSd dwarfs the Samsung’s 15TB SSD and other on the market. 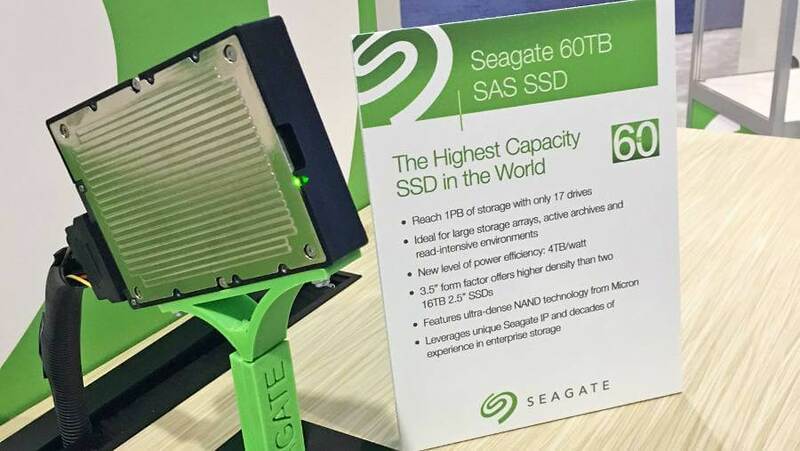 Actually, Seagate just beats the Samsung and other Storage devices manufacturers with its latest monster the 60TB SSD, It is world’s first every most huge storage SSD and holds the four times as much as Samsung’s recent 15TB 3D NAND SSD. The Samsung SSD has 512 X 256GB 28-layer V-NAND chips stacked in the 17 layers inside this SSD. This 60TB drive is big enough to carry 500 million pictures, Big Games, over 12K to 13K movies and much more. This SSD is only available for only the demonstrations, but it will officially make its entry in 2017. But here’s the one problem we don’t yet actually know how are the 60TB drive looks and its design, so we’ve not provide the prices and leaked images on this blog. The company says that 8TB Nitro XP7200 NVMe SSd will be available via some channel partners by the end of 2016. Do you know that Seagate’s 60TB SSD is also six times as much as it owns previous 10TB 3,5-inch drive, but yet we don’t how many time more its costs that its previous 10TB drive. Seagate also says that we could see the also 100TB, (yes, hundred) SSD after manufactured of 60TB SSD or may be in future.